What Does Joshua 5:13 Mean? God instructed his servant to be strong and very courageous. 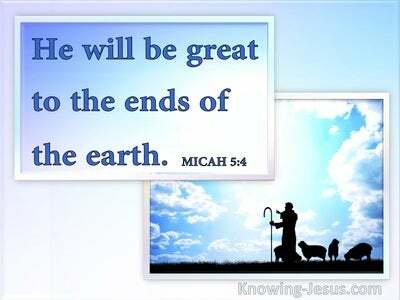 He promised that just as He was with Moses, He would also be with Joshua. 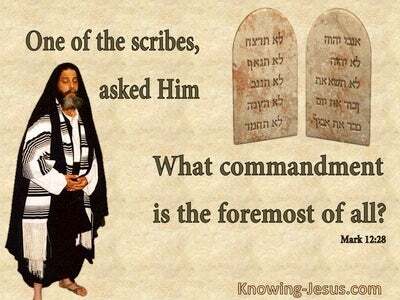 He was to be careful to follow the law given to Moses and was warned... not to turn away from anything God said - so that he would have success wherever he went. Joshua was urged to meditate on God's word day and night, and to be careful to follow it exactly, so he would be prosperous, and have great success. The first city to be taken was Jericho. 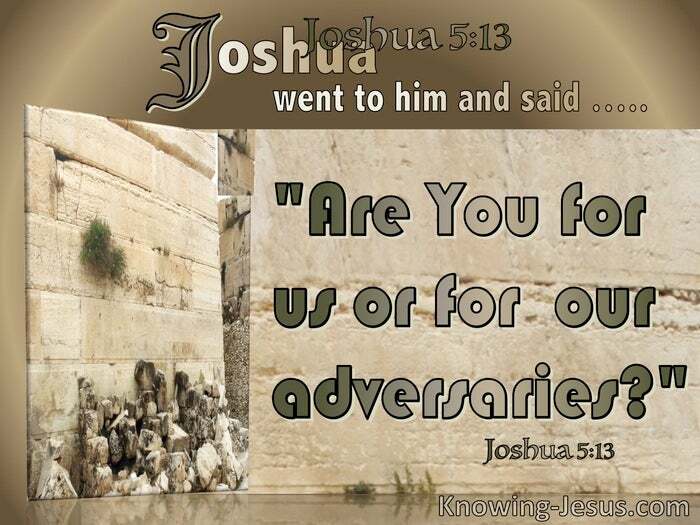 Just as he had been one of twelve spies, chosen by Moses to survey the land before crossing the Jordan, Joshua sent two scouts into the city to discover any of Jericho's vulnerabilities. As he prepared the great multitude of second-generation Israelites, by circumcising the men and celebrating the feast of Passover, he must have been astonished at Jericho's strong fortification - and no doubt bewildered as to how they would secure this fortress with their simple weapons of war. As Joshua had received no instruction from the Lord, since crossing the Jordan, and realising how well-fortified the city was, he went to scout it out himself... and consider how they might take possession of this impregnable city, with its immense walls and great defences. And so we read "Now it came about when Joshua was by Jericho, that he lifted up his eyes and looked, and behold, a man was standing opposite him with his sword drawn in his hand.."
Not expecting to see anyone - either friend of foe, Joshua instinctively challenged the stranger by asking, "Are you for us or for our adversaries?" He has given no instruction to his own army to leave the camp, so any Israelite he encountered as he surveyed the city landscape, would have been disobeying his order - especially by drawing of a sword, as no such command had been issued. 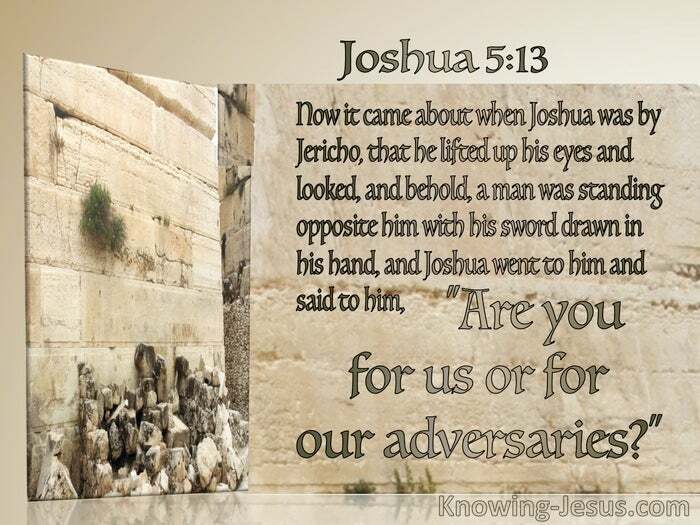 If, however, this encounter was an enemy soldier barring his way.. with a drawn sword in his hand, Joshua's was ready to fight. Although prepared for battle, this courageous man of God was not impulsive, and conducted himself wisely... by challenging the stranger, and asking him - "Are you for us or for our adversaries?" - Friend or foe? was the challenge he gave to this man. This was no ordinary man, and the answer given, caused our hero to fall on his face, and bow down and worship this stranger. 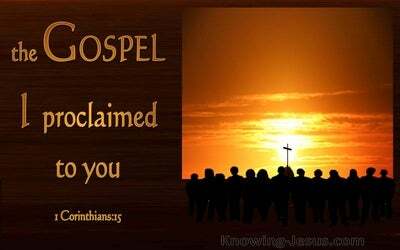 Joshua recognised that he was in the presence of a supernatural Being. The man before him was none less that 'The Angel of the Lord' - a pre-incarnate appearance of the Lord Jesus Christ Himself, Who answered His servant - "No!! Rather I indeed come now as Captain of the host of the LORD." This Captain of the Lord's Army, who met with Joshua, is the same Captain of our Salvation. He came to Joshua to take control, just as He comes to lead and guide us in the way that we should go. 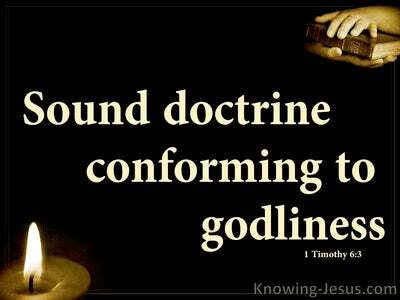 Had Joshua been self-assured chosen to resist this Man, and taken control himself - his defeat would have been assured, just as our self-control; self-seeking; self-confidence and self-importance is destroyed, when we allow the Lord His jurisdiction over our life. Like Joshua and the Israelites of old, if we stand firm on the word of God, and are careful to follow all that God has said, we will prosper; have good success and defeat every opposition we encounter - but when we refuse His leading and guidance, God will correct and chasten us, until we are ready to submit to His leading and put Him first in our lives.